Circumstances have been pretty dire for the werewolf genre over the past decade or so, forming a sparse pack of films that rarely, if ever, unleash more than merely tolerable thrills on the audience. During that type of downtime, it's unsurprising to see filmmakers attempt to push respective creature mythologies in unexpected directions; after all, it's within a gap in genre popularity that the likes of Let the Right One In and a few other unconventional vampire flicks came into being, created shortly before the modern vamp-romance thing took on a life of its own. A werewolf story from the mind of X-Men and Watchmen comic adapter David Hayter sounds like an opportunity for a divergent reinvigoration, perhaps fusing the conflicted pathos of a hero's discovery of their powers with creature-feature transformation suspense. Alas, in trying really, really hard to avoid shaping the small-town setting and love story of Wolves into a canines-'n-fur take on Twilight, Hayter's economical coming-of-age yarn ends up timidly coexisting in a dead zone between sobering fantasy-horror and youthful romantic drama. 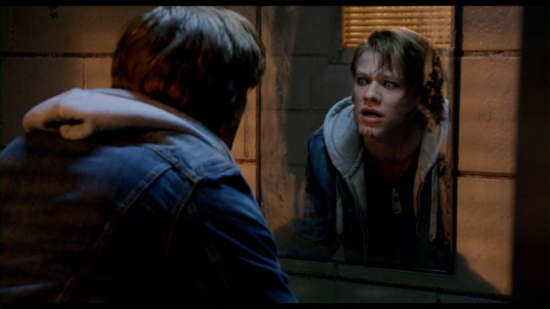 Lucas Till, recognizable from the two most recent X-Men outings as the energy-channeling teen Havok, stars as a rural football stud, Cayden, who's undergoing a few physical and emotional changes that aren't so readily chalked up to puberty. Along with a massive uptick in volatility on the field, he's also experiencing passionate mood swings, leading to a few irredeemable -- and fatal -- incidents that drive him away from home and on the road. Eventually, Cayden stumbles into a semi-sympathetic, knowledgeable stranger (John Pyper-Ferguson) who sniffs out his true self, then points him in the direction of a place accepting of his burden: Lupine Ridge. I know, I know. As soon as Cayden rolls into the town, he's met with a less than warm reception from the locals, save only a few: Angel (Merrit Patterson), a gorgeous owner of the local bar with deep ties to Lupine Ridge, and John (Stephen McHattie), a sharpshooting local farmer. 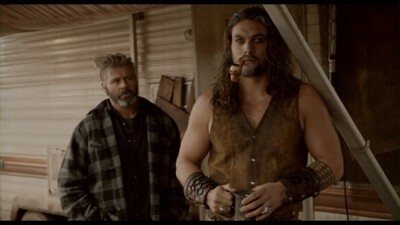 Cayden decides to stick around due to his lack of living prospects, while the town's secrets gradually come to the surface the longer he's there ... and the more he draws the attention of Connor (given sassy charisma by Jason Momoa), an intimidating longstanding citizen with significant pull in the area. Matching certain expectations of writer/director Hayter, the tone at the beginning of Wolves operates more like the troubled origin story for a superhero -- think Rogue's character arc in the first X-Men -- than the setting for a calculated horror film. He guides Cayden through the discovery of his gifts and curses as a young, compassionate werewolf fighting against his primal urges, building sympathy for the frightened kid as he careens from location to location with narration filling in the gaps of his situation. Lucas Till repurposes the effortlessly conflicted, malleable demeanor he delivered in X-Men: First Class for Cayden, with dashes of smolder laced throughout his timid charisma that largely overcome his one-note temperament. 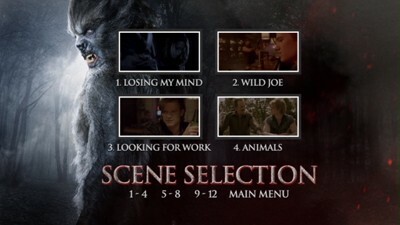 Despite some cliche plotting built around the teen's initial problems back home, the angle Hayter takes with the werewolf premise -- recalling bits-'n-pieces from The Howling and Teen Wolf -- appears at first as if it could work, assuming the film eventually works Till into a rush of feral action as his own kind of shape-shifting mutant. Once Cayden settles into the Lupine Ridge community, Wolves starts to grow a bit ... hairy, both literally and figuratively. Granted, Hayter's 90-minute film doesn't have the luxury of time to establish much of a mythology behind the town's sordid history -- unlike, say, Mystic Falls from Vampire Diaries -- but that wouldn't be a problem had the story not relied so much on its obscure lineage to propel it forward. Like this, Wolves swiftly establishes a token safe-zone for those like Cayden that's built on bizarre pack mentalities, power struggles, and archaic rituals, amounting to little more than a manufactured setting for the noble young werewolf to discover the root of his bloodline and save a damsel in distress. Ancient documents and fancy pipes being smoked by wolves in human clothing aren't enough to enrich the personality of the unimaginatively-titled Lupine Ridge, nor is the banal romantic link between its fresh-faced stranger and the town's beholden princess, flirting with the same brand of animal-urge allegorical clumsiness of a certain other horror-romance property before subverting it. While the action does eventually pick up in Wolves as anticipated, coinciding with an uptick in fully-transformed werewolves sorely missed throughout the preceding events, very little of it all delivers enough grittiness to offset the roundabout beastly melodrama. Featuring unintimidating wolf designs that'd probably get shrugged off at someone's local haunted house, there's just barely enough of an edge behind Hayter's visceral pursuits to begrudgingly earn an R-rating, where a few slashed throats and impaled torsos muster little in the way of chills throughout its busy climax. In place of genuine terror lies a series of threadbare plot twists and revelations designed to enrich Cayden's origin, conveniently avoided and changeable details that only serve to warp his path to catharsis instead of authentically deepen his character. Thing is, neither Cayden nor Lupine Ridge's back-story are compelling enough to justify how Wolves breaks away from traditional horror-film pursuits, which results in a bunch of half-concealed influences thrown together without really figuring out what breed of flick it needs to be. Wolves takes place in a pretty even divide between daytime sequences around a rural environment and slate-covered nighttime stretches, both of which reveal their own strengths and stumbles through Ketchup Entertainment's 1.85:1-framed, 16x9-enhanced transfer. Exterior shots bathed in sunlight pull compelling tans and greens out of the rural landscape, resulting in healthy but responsive skin tones and appropriate contrast levels, but some noticeable digital noise crops up in densely-detailed elements (such as cornfields and facial hair). Similarly, night sequences render cooler skin tones, yet black levels stay largely under control -- aside from a few noticeable deep-contrast sequences that swallow up detail -- and allow faint shades of green and blood-red to creep up from the image. Interior sequences are fairly dim, but they're also the most finely-detailed and responsive to lighting conditions. While not without stumbles, Wolves looks pretty decent. The complementary Dolby Digital 5.1 treatment sinks its teeth into a surround atmosphere more than expected, resulting in meaty atmosphere around the idyllic farmstead, Angel's tense bar, and the bonfire gatherings of the local werewolves. Paired with energetic, tense music that occupies the front and rear channels as frequently as environmental touches and jump-scare effects, the full stage sees a fine amount of separation and immersion, though that occasionally encroaches on the mediocre clarity of the dialogue. Verbal delivery never suffers to a point of being indiscernible, but it's frequently flat and constricted within the center channel. The bass channel gets a workout during body-slams (both in combat and in more passionate circumstances), while the snarls and growls of werewolves are clear and dynamic enough to get the job done. There are no subtitle options and only the sole Dolby Digital track. Only a Trailer (1:38, 16x9). Somewhere in the space between campy '80s werewolf cinema, a contemporary horror-romance franchise, and a superhero origin story lies David Hayter Wolves. Instead of sneaking up as a jack of all trades in the absence of stronger horror outings of the werewolf subgenre, it ends up not satisfying any of those camps in its visceral restraint and anemic drama, constantly in a struggle with small-screen limitations and performances that range from suitable to dodgy. 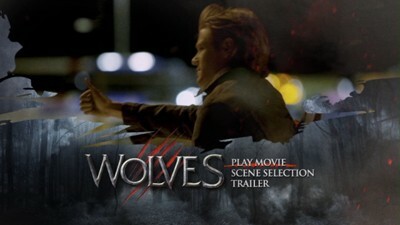 Despite a fairly encouraging beginning to Cayden's story, Wolves ultimately transforms into a mess of terse-yet-dissatisfying action and wonky twists that get lost on the path away from entertainment. Worth a Rental for its meager successes and novelty value, but that's about it.